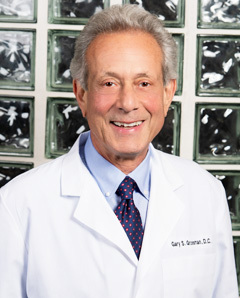 Dr. Gary S. Grossman is originally from Glens Falls, New York. He graduated from Syracuse University in 1975 with a degree in biology and psychology. His chiropractic degree is from Palmer College of Chiropractic West in Sunnyvale, California, graduating in 1984. After practicing briefly in San Jose, California, he joined his brother at Wymore Chiropractic in Winter Park, Florida. In 1986, he moved to Kirkman Chiropractic at 48 N. Kirkman Road before opening at his current location in 1990. Dr. Grossman is an active member of the American Chiropractic Association; the Florida Chiropractic Association; and the Central Florida Chiropractic Society. He is also a member of the American College of Chiropractic Orthopedists and the Council on Chiropractic Orthopedics. Dr. Grossman resides in Winter Park, Florida and enjoys spending time with his wife and two children. It’s been in his family for generations: the ability to adjust the spine restoring the proper alignment and improving the function of the body’s nervous system. Dr. Gary Grossman, owner and operator of Kirkman Chiropractic has been helping people with backaches in the Central Florida area for almost 20 years. “At one point, there were 12 family members that were practicing chiropractors,” Dr. Grossman said of his father, brother, uncles and cousins who were all in the same field. “It’s a family tradition,” he said. Dr. Grossman has been helping and developing relationships with his patients in the Central Florida area since opening his practice in 1987, just one year after moving to Orlando and working with his brother. Born in Glens Falls, N.Y., Dr. Grossman graduated from the Syracuse University with an undergraduate degree in biology and psychology in 1974. It would be several years, and several different occupations before he would continue his education in the medical field. Graduating with a Doctorate Degree from Palmer College of Chiropractic West, California, in 1984 Dr. Grossman found himself moving to Orlando and connecting with his brother who already had a practice here. It would be three to four years before his next big business decision to relocate this expanding practice. One day on arriving at his old office, he noted a for-sale sign across the street. “I immediately called and bought the property.” Within a short period of time the office was moved into a new building at its current site at 110 North Kirkman Road. Dr. Grossman also said that the current office has grown so much that he rented back his original office space across the street and moved his administration department there. Today, Dr. Grossman is the first person in the building and often the last to leave. He owns it, so therefore he is always making sure that everything is correct and productive for the next day’s work. With a staff of two in 1990, he now has 14 employees currently working, consisting of two additional doctors, Dr. Wilson Talo and Dr. Kimberly Soliman, physical therapist, massage therapists, x-ray technician and administrative personal. “I look forward to coming here,” he said. “I like working with my patients…it’s the relationships you make,” he added. Taking care of someone’s spine in only a fraction of what Dr. Grossman instills to his team. With daily meetings, he is always stating that it’s all about building relationships with everyone who comes into the office, whether medical treatment is severe or not. “The more we can understand them, the better we can provide them with a service,” he said. For a new patient coming in, Dr. Grossman and his team are thorough in discovering the source of pain that someone is feeling. The first step is to set-up a consultation with either Dr. Grossman, Dr. Talo or Dr. Soliman to discuss the patient’s complaints. From there, the patient will undergo a full examination to pinpoint the cause of the problems. Once the issue has been found, the patient is informed and given recommendations for types of treatment, whether it is to schedule chiropractic treatment, regular massages or physical therapy. “Many patients come to us not understanding exactly what we do” Dr. Grossman said. “Part of our job is to educate them on the benefits of chiropractic care. Depending on the nature of a patient’s case, Dr. Grossman is not adverse to sending patients to neurologists, orthopedics and if necessary, surgeons. “I order them routinely,” he said. But Dr. Grossman is quick to point out that “our job is to help the body return to its normal functioning without the use of medication or surgery.” “Medications can cut off the alarm,” he said, explaining that pills don’t necessarily fix problems, but in fact, often hide them. Adjusting the spine and maintaining regular treatments can re-work the alignment of the body and create a healthy, new path for a person’s health. Chiropractic can be very successful treating issues such as neck pain, sports injuries, automobile injuries, disc problems, headaches, back pain, arthritis as well as arm and leg pain. For more information or to schedule an appointment to consult with either Dr. Grossman, Dr. Talo or Dr. Soliman, please call our Orlando chiropractic office at 407-291-1000. Same day appointments are available as well as convenient hours on Saturday. Kirkman Chiropractic is located just north of Colonial Drive on the corner of Kirkman Road and Washington Street. We look forward to meeting you!